Luke’s dreams were dashed when he sustained a biceps tear during his senior football season. When the injury healed, he turned his focus to bodybuilding and found his calling! I've always had an interest in weightlifting. I remember being five years old and trying to work out on my dad's home gym. I got serious about weightlifting in eighth grade. My calorie intake was increased by 500-calorie intervals until I reached my target weight of 185 during my freshman year of high school. That year, Dave Smith became our new football coach. He emphasized weight training for football and took me under his wing. We experimented with the "gallon of whole milk a day" diet my junior year and my strength and weight gains went through the roof. 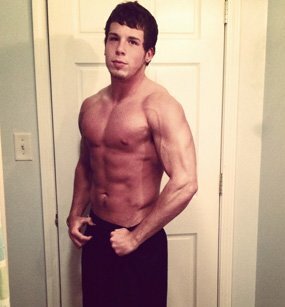 I moved out of the home gym my junior year and began working out at 121 Fitness. My lifting partner, Brandon Hill, did a fantastic job keeping me motivated and concentrated on my goals. 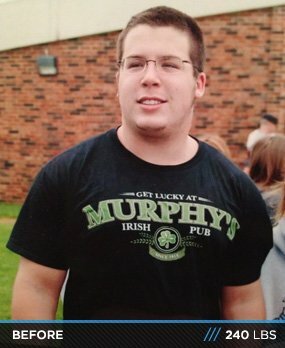 By my senior year I weighed 240 pounds and benched 405 pounds off my chest. My senior year of football didn't go as planned. The fourth game into the season I tore my distal tendon in my biceps. All that work seemed wasted. I made the decision to attend a community college in town rather than pursue college football. It was important for me to find a hobby because I get bored easy. After my recovery, I decided to look the best I could instead of being the strongest. My seven-month journey to transform my body began. I knew what my goals were and I was determined to accomplish them. The first step was adjusting my workout routine from a power training style to a bodybuilding style. I put away all the fattening food I was accustomed to and replaced it with lean meats and produce. I was never a fan of cardio, but that changed. I stuck to this regimen religiously and made serious changes. Consistency was the key. If you eat great for three days of the week, but splurge for the other four, your gains won't be significant. I've always been skeptical about supplements. It's hard to know if you're really getting your money's worth sometimes. My mom and dad don't buy me supplements, so I'm forced to buy my own. That starts to get rough when you're a full-time student making minimum wage at a local grocery store. I stick to a standard protein, creatine, and pre-workout supplement routine. I use a three-day split covering every body part. My routine is designed to target my weak points, so it may not work best for everyone. I usually alternate cardio and abs each day. For example, on chest/back days I'll run a half mile and do 10-50 meter sprints. On leg day, I'll do a random 30-minute abdominal routine. I never do cardio and legs on the same day. Staying on a clean diet while balancing school and working 30-hour weeks was the toughest challenge for me. Most of my inspiration came from bodybuilders like Frank Zane. I admire the "Golden Age" of bodybuilding a lot more than modern bodybuilding. I'm just going to continue school and work, and maybe one day I'll be able to work in the fitness industry. Then I wouldn't have to work at a grocery store. That's my dream. Find a clean diet and stick to it. Be patient. You will not transform overnight. When you do transform, it will be one of the greatest feelings ever. 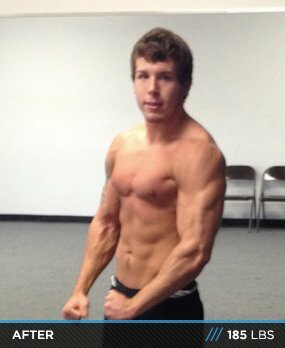 Bodybuilding.com has been a great tool to help me reach my goals. From supplementation to dieting and lifting routines, this is the site for guidance. Thank you, Bodybuilding.com.